Every journey starts somewhere. You can’t get off “Go” unless you know where that somewhere is. Let us help you identify assets and liabilities to chart a course for business growth. Move your business from where you are now to where you want to be . Do you want to fully identify your potential and possibilities? Are you looking to unlock creative solutions to increase profit and performance for your business growth? What could you do? What should you do? What will you do? When? An established process utilizing your defined objectives and a few simple rules will help you realize the focused business results you have been looking for because your business deserves more than just another great plan. Sara Hand is an invaluable resource for entrepreneurs. Her business acumen and extensive network of colleagues provides business owners with instant access to game changing opportunities and contacts. She has spent decades cultivating relationships with a myriad of influential leaders in Florida and beyond. Sara is an entrepreneurial force of nature. “Everyone” is not your prospect. There is a specific group that can be identified as “Your” prospects. Just as there is a uniqueness about you, characteristics that make you different, make you special, make you unlike any other human being – just as you are unique as an individual, so are you as a business. Yes, there may be businesses that provide a product or service that is similar to what you provide. However they are not you AND that IS important. Because it is in your difference, your uniqueness, that something called a unique selling proposition comes forth. People buy a product or service …YOUR product or service because of what makes you different not because of how you are the same as someone else. Getting your message out is important. Getting your message out to someone who could be your prospect is more important. Getting a message out that distinguishes your business as unique and different to someone who could be your prospect is essential if you don’t want to compete on price alone. What we do best is to help you identify what makes you most valuable in the marketplace and what to do about that for maximum impact and results. Great research comes together with your unique value proposition in detailed action plans. With the right team to implement and the necessary support from us to stay on task, businesses experience extraordinary results. If you don’t know what makes you specifically different and unique, and you would like to be more profitable and more effective in how you spend your time and money, commit some time to defining that position. It will pay off! Neither of these habits is necessarily bad. However, if you don’t know that the marketplace is flooded with exactly what you want to build and your competitors are much better funded than you and with an exceptional team, that could be a problem. Or maybe your best friend is incredibly supportive, but that doesn’t mean that you want them to be your business development director does it? A very successful serial entrepreneur friend says, “Fail fast.” Market research and feasibility can tell you if “this” is the idea to put your efforts into or whether there might be better choices. Build Better – Gain Market Share Faster – AND Make Money Sooner. …wade through all the information? How do you decide? At S-Hand Group we came up with a tool to help evaluate and simplify decision making for ourselves and the businesses with which we work. 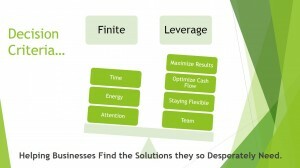 We start with understanding that some critical components of life and business are finite. Each one of us has the same 24 hours in each day, and we each have a certain amount of energy and attention. If we take care of ourselves, get the right nutrition and appropriate rest we can function at higher levels. However, that in itself is paradoxical challenge. Because the more hours I work and the harder I push myself to work, the less rest I get. Although possible for periods of time, it will eventually catch up and I become less effective. So I am back again to limitations and have to look for tools that will increase my abilities within those constraints. After limitations, the next key question is, “What am I looking to accomplish?” Whether just starting a venture or well into building your enterprise, there are four buckets most business objectives fall into: maximizing results, optimizing cash flow, staying flexible and build/grow/maintaining your team. Whether free or paid, tools and services you consider should facilitate at least one of these four goals to be worthy of consideration. With big goals and finite resources, the challenge is to leverage your capacity and still achieve your potential. Because Your Success is OUR Business Get Started Today!